You are here: Home / Asia Travel Archives / Nepal / Nepal Trekking Gear. What to Wear, What to Take? What gear do you really need for Nepal. Trekking gear companies tell you to buy x, y and z before you even think of setting foot on the Himalayas for fear of death. I’m here to be more realistic. You don’t need everything they try to sell you. So keep your money in your pocket a little longer and read on. We’ve trekked Everest region (March 2016), Everest Base Camp ( October 2018) and the Annapurna Circuit in winter ( February) So let’s get real here about the trekking gear and equipment you will need for Nepal. Some people head off for a walk looking like they’re summiting and it’s nuts. Don’t be that guy. I’m not going to advise you, just tell you what we found necessary or unnecessary, obviously you know your body and its comfort levels. You have to make your own call and tell me what you decide in the comments. OK? The gear you need will also totally depend on how long you’re trekking and how high you’re going, at what time of year. Our treks have been in winter to early spring and in October, peak season. If you pay a porter to carry your gear, sure, you can take the kitchen sink, but those of us who prefer to carry our own pack have to think about weight and necessity. 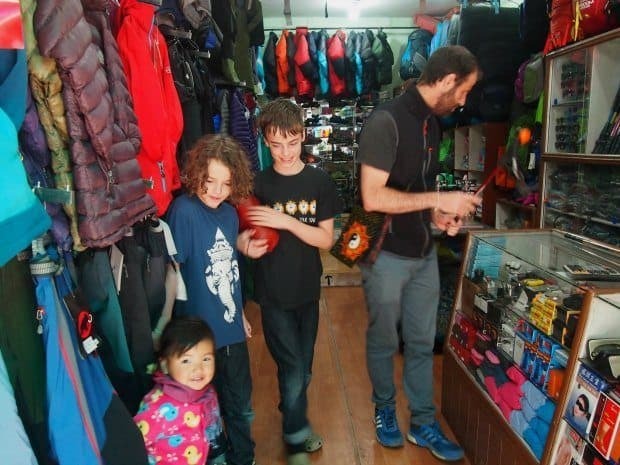 Buying trekking gear in Kathmandu. The lovely lady owner sold us a trekking pole, two “down” jackets for the kids and a couple of fleeces. How could we not when her daughter was this cute? The down jackets are still wearing well in exceptionally cold Romanian mountain conditions almost a year later. Prices are a fraction of what you’d pay at home. The Thamel area of Kathmandu is packed with trekking gear shops. Some is genuine and sports a hefty price tag, most is fake but does the job just fine. Always negotiate on price. If you have a few days to spend in Kathmandu or Pokhara before your trek you can easily kit yourself out. If you have children or you’re a larger size, this is harder. Whether or not to trust the quality of the fake gear? It’s up to you. 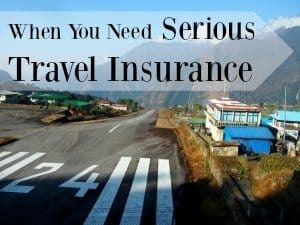 I have a lot of equipment bought in Kathmandu, as mentioned in this post, it’s always done me just fine. If you’re short of time then bring your trekking gear with you. 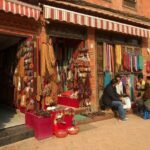 You’ll want to spend your time enjoying the sights of Kathmandu, not traipsing from shop to shop. If you get stuck and are heading off on the Everest Base Camp Trek, we noticed this year that prices were good and often fixed in Namche. This is new. We bought extra socks and poles up there at better prices than Kathmandu. Don’t scrimp on anything that could put you, your toes or fingers at risk. Everything I tell you on this page will help you keep your costs down, but be wise, stay safe. 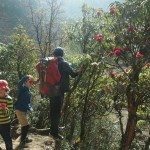 Trekking in Nepal is expensive. It just is. If you’re really low on funds maybe wait a year or so. The power was off more than it was on a couple of years ago in Kathmandu and Pokhara. Things are better now but if, like us, you’re reliant on electronic devices like phones, laptops and Kindles, you will need electronic power back-up. In the mountains it’s normal for guest houses to charge you to plug in. Sometimes the fee is per charge, sometimes it’s per hour. It’s a couple of dollars here and there and costs quickly add up so it makes sense to take devices with ultra-fast charging capabilities ( the power pack below has this, as does my phone/camera mentioned below). In 2016 we took 2 rechargeable power packs, in 2018 we’re travelling with bigger better ones and solar charged power packs. We can charge as we walk. If you are travelling long-term it’s always a good idea to carry these anyway. If you are shopping from the USA the model below would be our pick. Unfortunately it doesn’t seem to be available elsewhere just yet. 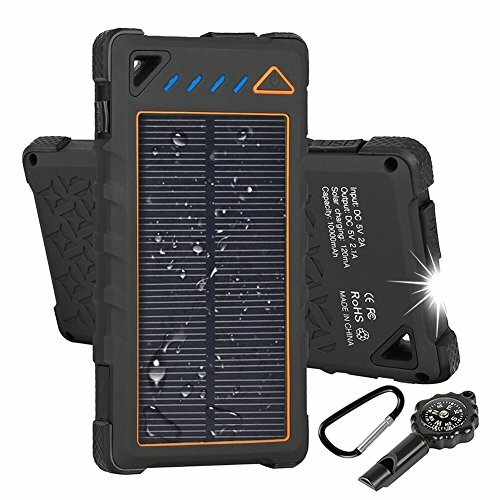 We like this Hobest 10000mAH solar charger a lot. It’s not the model we have, we have a couple of Hiluckeys which are still going strong, but this new charger above is better, it’s what I’d buy today if I needed to replace our old models. 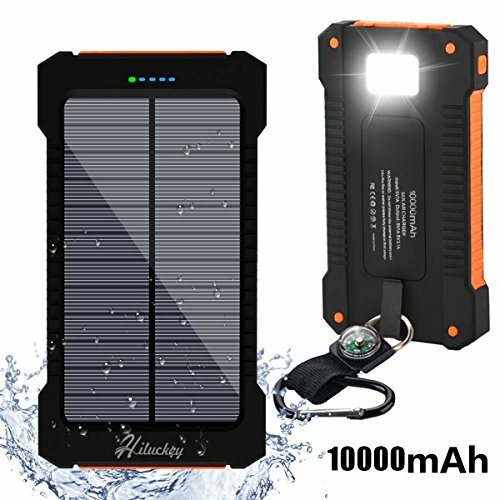 It’s waterproof, dustproof and shockproof, has extra fast mains charging as well as solar, can charge 2 devices simultaneously via twin USB ports and will clip on the outside of your pack to charge while trekking. It has a built in flashlight and comes with a whistle and compass. Love this model! See it here. For shoppers outside the USA, these are the chargers we own and use currently. We’re happy to recommend them as a solid choice. We would only take a rugged model, at very least it should be waterproof and rapid charging is a must. Check out our Hiluckey chargers here. The cold of the mountains makes batteries lose their charge quickly, you will need spare batteries. As you most likely won’t be taking your laptop on trek and internet coverage is spotty at best, you’ll also be best taking plenty of memory. As a professional travel blogger, I travelled with a Nikon D3300 , it was the most compact, most lightweight DSLR I could find at a non-scary price. It’s a popular camera because it’s so good, an excellent entry level DSLR and for the Himalayas and the wonders of Kathmandu, you will want a good camera. However, technology has marched on and as of late 2017 I did away with the bulky DSLR in favour of an excellent camera phone. The Samsungs are excellent, so are the Apples, but my choice was between the new Huawei and Moto models because of their twin lens capabilities. In the end I went with the Motorola. This decision wasn’t based on price, it’s a cheaper phone, yes ( so realistically, a better travel choice), but it had the 3 features I needed, those twin cameras to give me incredible wide-angle shots, toughened glass and water resistance. None of the top dollar models offered those 3 things at the time. I buy phones unlocked to use anywhere in the world with local sim cards, see my Moto here. When using a phone as your primary camera, instant backup to Google photos makes life oh-so-simple even for me as a travel pro. The Motorola also has fast charging, super useful when lodges charge for charge by the hour. A trekking watch maybe isn’t essential, but it’s certainly nice to have a watch with an altimeter, thermometer, barometer and GPS. My husband likes to have a watch with a heart rate monitor because he uses this for his Ironman training and events, I prefer the Casio watches for trekking. Have a look at our full post on trekking watches here to see what’s on the market. He tracked our ascents, decents, pace and distance on the EBC every day and it was great to be able to do that. Knowing your pace gives you a better idea of how long it will be before you reach your lodge. On trek you will certainly need a large water bottle ( 1 L, 32 oz, a quart approx) see here , maybe two. Wide mouthed is best, you will often fill your bottle with boiled water or even black tea in the trekking lodges. Otherwise you can fill it from taps, hoses or streams and use purification tablets. Make sure you can fasten it easily to the outside of your pack. Camel back type drinking systems are also useful. 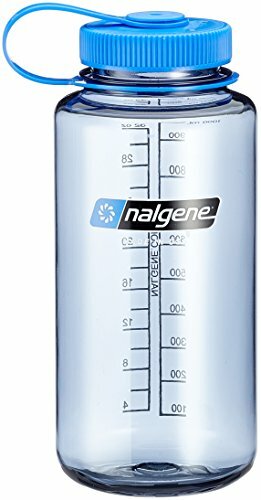 You can buy Nalgene type water bottles in Kathmandu but I’m not comfortable with them, are they real? Are the BPA toxins in the plastic going to leach into your water? I’d buy these at home and know for sure they are BPA free. Tip: A water bottle filled with boiled water ( or black tea) makes a good hot water bottle and is ready to drink in the morning. If you’d like to insulate your water bottle neoprene sleeves are also available, click through the link above to see them. A Lifestraw will allow you to drink from streams and springs and there are plenty up there, each more sparkling than the next. I’ve never used one but I have friends who swear by them. 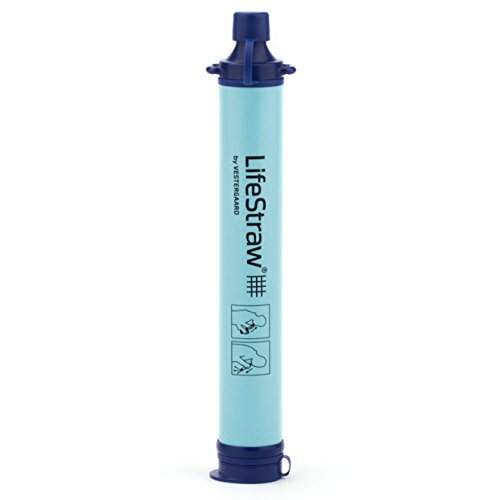 You could also carry water purification tablets, which we have used in India years ago, purifying each bottle-full of water as needed, or even opt for awater bottle with built in lifestraw technology. The choice is yours, but on our last trek we simply carried 2 large bottles of boiled water or black tea from each lodge we stayed in, they’re heavy, that’s the down side. Not essential, but they certainly make trekking easier and your knees last longer. I hike with one, others use two. I have one I bought in Kathmandu but there are some amazing ones available to buy online. The best selling trekking poles on Amazon are shown below. As you can see, they are pretty cheap, mine, from Kathmandu, was about the same price. This one is a tough call. We’ve taken our own sleeping bags, bought cheap bags in Kathmandu and trekked without sleeping bags of any sort. Trekking lodges supply blankets but I doubt they ever wash them. They are plenty warm enough, but do you want to use them? A good solution is to take a sheet sleeping bag liner, see below, and for my entire EBC trek in October this was all I used. Sleeping bags are terribly bulky to carry and it’s a difficult decision to make, take one, or risk it? 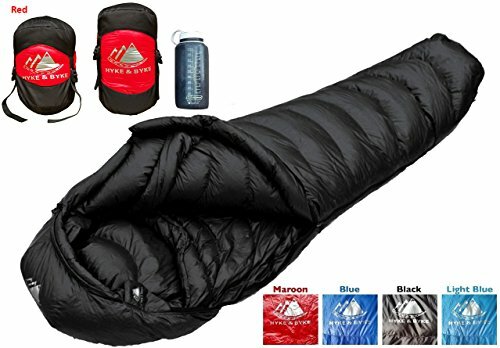 If I were heading to Nepal specifically to trek ( EBC, Thorong La, anywhere extreme) and buying and carrying gear wasn’t an issue, I would absolutely take my own, high quality trekking sleeping bag. But for lower altitude hikes I maybe still wouldn’t bother and maybe just take a fleece liner ( below). If you’re going high look for a bag that is ultra light ( the lightest mummy bag on the market is 1.9 pounds, but it isn’t 4 season), mummy ( to save bulk) with hood ( essential) and ideally down. It should be 4 season or suitable for below freezing conditions. You’ll be looking for something like the bag below. This bag’s little brother is the lightest on the market , but only takes you to 32F, not 15F. This one is heavier at 2.9 pounds to the Hyke and Byke Shavano’s 1.9 pounds, but you’re carrying extra warmth at under $40 extra cost. Check out the Hyke and Bike Quandary here. 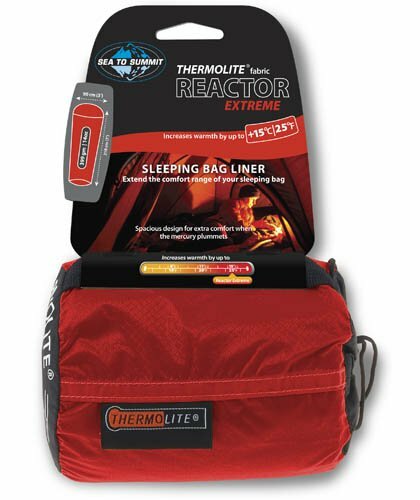 Sleeping bag liners, in cotton, silk or thermal materials are a very good travel investment. They’re not essential if you have your own sleeping bag, but if you plan on hiring a bag or not taking one at all, they’re gold. TIP: Always go for mummy shaped sleeping bags and liners to reduce bulk and weight. The Sea to Summit Reactor Extreme ( above) claims to add up to 14C to a sleeping bag, is mummy shaped with box foot and drawstring hood ( you will need a hood or hat in bed) It weights under 350g. See it here. You are fairly unlikely to take a shower during your trek, it’s too cold and the guest house owners charge per hot shower, that is, if their solar heating is working. Lower down, yes you may find showers and they will be variably hot. Take a travel towel, they aren’t usually supplied by the trekking lodge. You’ll want one for drying your hands or cleaning your teeth anyway. Micro towelling is good, we have towelling travel towels that are 20 years old, but microfiber is lighter and easier to wash and dry. We even use these Mountain Warehouse extra large travel towels at home. We recently did some research on which travel towel was best. We bought a bunch, weighed them and tried them out. We wrote a post on our findings here, but the clear winner, and the lightest,was this one. We are currently travelling with this towel as well as our old Mountain Warehouse versions. A family can never have enough travel towels! 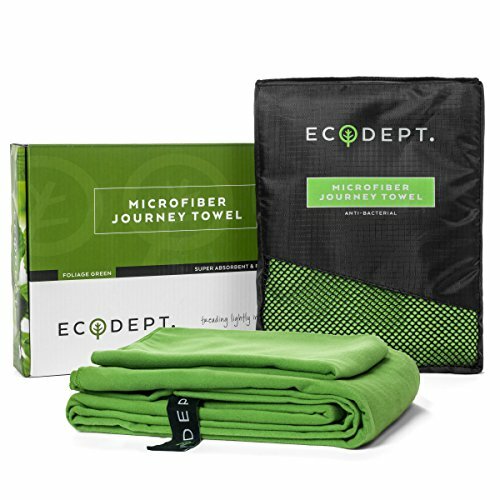 The Eco Journey towel below also comes with a free mini-towel which is very useful for hands face or feet if you want to keep your main towel dry. You can easily wear it on the outside of your pack to dry it during the day. You can buy this towelhere. 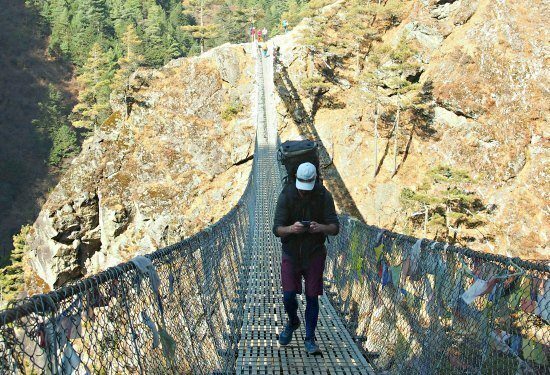 Chef on “that” bridge before Namche Bazaar, in shorts, running tights and running shoes. We crossed this bridge in snow 6 days before, in the same clothes. See our post on scary bridges, I hate these bridges! Don’t feel you have to go out and buy the best trekking boots on the market just because you’re going to the Himalayas. My husband has been high in the Himalayas in running shoes and in top of the range crampon-ready leather Scarpas . I’ve been up there in light summer trekking shoes and in summer-weight hiking boots, the latter in deep snow. One of the kids had hiking shoes bought in Kathmandu, the other had street shoes, winter type basketball boots, he got to Tengboche Monastery. We did great in all of the footwear mentioned above. My husband preferred trekking in his running shoes right up past Namche Bazaar and into light snow, he found he slipped less and walking was easier. Once the snow gets thicker, boots or good shoes are better. My summer hiking boots did OK in deep snow, but I was hitting them with waterproofing spray every day. In snow, always add gaters ( buy these on the trek or in Kathmandu, quality isn’t critical), they help keep the snow out of the top of your boots. Running shoes will do you for EBC in good weather and you’ll see plenty of people doing this. I’m not advising you not to buy serious hiking boots, I’m just telling you not to worry too much particularly if you’re not going into deep snow. Frost bitten toes are obviously to be avoided. We’ve seen people cross the Thorong La in armpit deep snow in running shoes, it’s not a great plan, but I’ve also seen the hard sell in the hiking shops to buy the most expensive gear, often from sales people with no actual experience, just have your wits about you. Trekkers don’t normally need crampons, but on certain hikes, where there’s ice, they do. You can buy crampons on a stretchy rubber frame that slip over your boots and shoes in Kathmandu and in Namche Bazaar. You will be wearing the same socks for multiple days without washing them. Unless of course you hire a porter to carry your wardrobe. Sometimes I trek in thick hiking socks, sometimes in thin street socks, to me it makes little difference in well broken-in shoes or boots. The extra cushioning on the bottom of designated hiking socks can be very nice though. You can pick up socks in Kathmandu but we struggled to find kids’ sizes. I’d recommend bringing at least a couple of pairs of good socks with you from home. 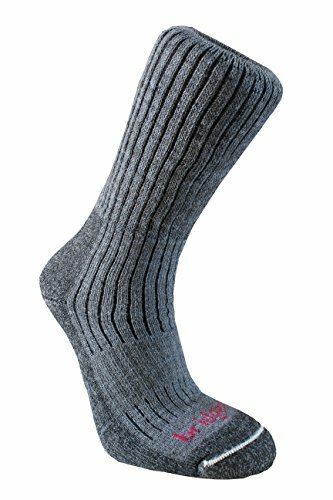 Quality trekking socks like these are a good investment and can last decades ( mine have!) Bridgedale are a classic, quality brand. You absolutely can’t go wrong with Bridgedales. We’ve never bought trekking pants so can’t comment. We’ve trekked in a strange mixture of jeans, leggings, yoga pants and shorts and did just fine. If you’re going high or into snow add waterproof over trousers or special cold weather trekking pants. People recommend thermals and merino this and that. We just wear long-sleeved T-shirts, fleeces, hoodies, etc. I’ve never owned nor needed thermals for trekking or skiing. We’ve taken down jackets brought from home as well as those bought in Kathmandu or even hired in Pokhara. We’ve carried waterproof jackets and used them in blizzard conditions on the Thorong La ( Annapurna’s High Pass, see video below). What you take, as always, depends on how high you’re going. I’d still steer clear of trekking stores’ ” must buy” lists. You can buy huge, thick fleeces very cheaply in Kathmandu, I’ve had mine 15 years. Absolutely, you don’t want snow blindness. We trekked with a guy who’s glasses had broken, he had snow blindness for days and it’s not nice. This is the brand of sunglasses we use, they are high quality, high performance and come with a lifetime guarantee. You can order them online, anywhere in the world. Fingers are particularly susceptible to cold. Yes, you need gloves of some sort but not necessarily top of the range. You’ll want something on your head but it doesn’t have to be a designer item. Buffs are great, but a cheap one from Decathlon does the job just fine. Check out what we’re wearing here, this was in the worst possible weather you’ll get, serious cold, blizzards ( we were stuck up there at high camp for 3 days) and 5,416m at the top of the Thorong La on the Annapurna Circuit. The height is similar to Everest Base Camp. A sun hat, a kramer from Cambodia and a buff, along with the hood from my waterproof jacket, did me fine. A cap is great too, to keep the sun off your face. If you’re long-term backpacking you simply can’t fill your bag with the perfect piece of gear for every occasion. If your trek in the Himalayas is a one-off, big event and you have cash to burn, sure, buy all the designer gear. I’m not trying to give advice, just present you with options that will help you ignore the marketers, save the planet through consuming less and save your cash. Hi Alyson, I’m planning on doing the Annapurna trek in October/ November 2019 with my 24 year old daughter , I was last on Nepal trekking in 1986 trekking clockwise from Pokhara to Jomson, unfortunately I had to turn back due to a visa issue, now in my late 50s I want to go back and finish off what i started, we would like to do the Annapurna circuit trek, tilicho lake, throng la pass and onto ABC, in your opinion how difficult would it be to do this solo or would it be better to hire a guide/ porter, would getting accomodation be an issue during this time, any information would be much appreciated. I don’t think you need a guide Leo. Sure, it’s nice to put money in local pockets, but it would take some skill to get lost! If there’s a lot of snow up there, maybe, you could stray off the path. We were up at the Thorong La in deep snow, we waited 3 days for blizzards to pass and in the end were very glad of the friends we’d made along the way and the support we all offered each other. Some of them had guides, some didn’t. But that was Jan / Feb. Be warned that Annapurna Circuit is CRAZY busy these days. We had friends up there last October and the crowds were unreal. It was bad for us over at EBC at that time too, it’s peak season. Lodges get full. Read our post on Everest Base Camp Difficulty – that was last October. I can’t give you solid information as obviously, weather and crowds vary. But I’m hearing a lot about accommodation shortages over there. My husband is a climate change scientist and will be in Kathmandu for IPCC meeting in July 2019. The two of us have traveled over land from Lhasa to Kathmandu in 2005, I lived in China for a while between college and grad school, now we homeschool our kids (we live in the US) so that we can travel along as my husband has meetings everywhere. When we’re home, the kids are in wilderness school (and have been since they were 3 and 6yrs old), and they are troupers, we have all the gear you mentioned and they are used to camping long term, being outside in all kinds of weather, but they haven’t done any long term backpacking camping. They prefer mountains to cities EVERY SINGLE TIME. But, the younger daughter isn’t really all about pushing herself to her limits, the older daughter is definitely up for it. So we end up encouraging the younger one all the way, and then she’s happy and proud of herself at the end. As I’m sure you know, its exhausting to be cheerleader all day long, so I like to choose a happy medium. On this trip, we are flying into Kathmandu from the arctic of lapland, and will be continuing into China for a few weeks afterwards, but we really don’t want to miss this chance of trekking and being in the glorious inspiring nature and culture of the Himalayas. Any suggestions of manageable treks would be most welcome! Thank you!!! 5 days really isn’t long and we’ve nevr done any short treks. You could of course, fly up to Lukla and just walk for 2 days, maybe 3. Walking back is faster but it’s not easy, it’s not all up then all down You’d get to Namche Bazaar, get a view of Everest, you may get as far as Tengboche then have to turn back, but those flights can be an issue, there are a lot of cancellations because of weather. 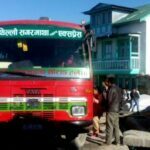 There are short treks from Pokhara, but you’d lose 2 days on the bus there and back. There may well be some short ones from Kathmandu but I just have never looked for them, sorry. None of them involve camping. If you can just get as far as Namche it’s certainly worth doing, but be certain your kids are OK with heights. The bridge before Namche is horrific and if my kids were scared of heights – as I am- it would be child abuse to force them over. Myself and my boyfriend are planning a trip to Nepal in Sep 2019- your blog has been incredibly helpful thank you! We are considering Everest base camp and Gokyo valley. We are both relatively fit and healthy but will take our time and from your advise organise the tour ourselves rather than go with a group. I estimate it will take us roughly 2 1/2- 3 weeks. What is your thoughts on the Gokyo valley as i’m unable to find a blog with this in? I’m worried about the weather in September and how cold it will get as we reach EBC. We have been skiing previously so have base layers which i’m sure will be ok but i’m worried about the night. As for the rest of Nepal we will definitely be checking out the temples etc you have suggested. Your piece about Chitwan and getting there from Kathmandu has been extremely helpful as I was unsure originally if we will do this but now i’m almost certain it’s worth a visit! After reading this i’m very excited and can’t wait for September to come around! Hi there. I can feel your excitement, that’s great. Did you read our post – Everest Base Camp difficulties? We were there last October, peak trekking season and it wasn’t THAT cold at night. Maybe getting to minus 10 C right up at Gorak Shep. Night time, ideally, you want to be in dry clothes if you’ve sweated during the day, but it’s not always possible, too tired, too cold to change, just can’t be bothered, but it’s sensible. You sleep in all your clothes, basically. A warm hat that will stay on in bed is essential, keeping your head warm makes all the difference. I didn’t have a sleeping bag even, just a sheet liner and a $8 fleece liner from Kathmandu, I was OK. I loved my leg warmers, wool ones $2, I’d pull them over my feet at night and mostly I just wore those with running tights or I started the trek in light jeans , comfortable ones with stretch. My husband mostly wore shorts then added leggings underneath at the top. I’m going to write a full EBC packing list post because there are some ABSOLUTE essentials and some items people suggest that are just ridiculous…like wollen bootees…you want to go in a wet squat toilet in wooly bootees? Crazy, then you have to put them in your pack the next day..just no. Anything else you need to know, shout, I’ll create the post. Gokyo we didn’t do. We sort of thought we might, but by the time we were heading back we were tired and longing for a shower and clean clothes and just didn’t want to. Also our Sherpa friend and another trekker warned us that it was pretty terrifying, steep drops, narrow paths and I’m not good with heights. So nope, we didn’t go. Might do next year, but thisyear we’re going to Pakistan for K2 base camp … which will probably also be terrifying. Also Alex, I started a Facebook Group, Trekking Travel, if you’d like to pop over there and chat. This is my first time in nepal and first time trekking in winter. Really nervous & dont know what to expect…but your article has soothed some of my nerves, thanks for that! Just really concerned abt the sleeping bags…should i really not buy them? And would just the liner suffice? Reading what you wrote abt snow upto armpits are really shaking me up ???? If we were going high we would most certainly take sleeping bags. Also if you have porters to carry them it’s no problem. 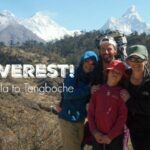 The post below is talking about lower altitude trekking, we didn’t go nearly as high as EBC or the Thorong La on this walk, only to Tengboche. If taking your own, clean, lovely sleeping bag was no problem, i’d take one absolutely, every time, but carrying one, and the expense, is an added burden. But don’t stress! Hi I am trekking Annapurna crossing thorung La & going to Tilicho end of Jan 2019 Feb 2019. I have never been to anything like this in relation to climate & am really nervous about how cold it can get. I have been told to have a base layer, a mid layer fleece & down/wind jacket is this all I will need? I have inner gloves and outer gloves, a few pairs of sock but havent got any pants as yet as I have been told I can get these in Kathmandu is this correct? It will be very cold. Probably. We did it in February and got stuck up at high camp in a blizzard. Don’t trek in conditions like that! People like to hand out these shopping lists of gear to make you spend more. It’s BS. Don’t think you need to buy everything especially for trekking from knickers up. Sure, you could. If you have money to burn it’s probably the easiest way. But if you don’t want to spend thousands work with what you’ve got. You will either need a very good heavy fleece or a down jacket. If you’re buying new get the down, it’s better. You may need a water/ wind proof outer coat and waterproof trousers. We took our waterproof jackets up Everest last time and used them for exactly 5 minutes. However, I don’t think I’d go without a waterproof jacket. It depends, if you’re trekking independently and can stop if the weather is bad, you may be able to get away with not taking one. If you’re in a group and on a tight schedule, you’ll have to push on despite the weather. Your base layer can be leggings of any sort, a vest, long sleeve T shirt. Anything. Or you can go with the expensive merino. Dry clothes to put on for bed does help a lot, but often you won’t want to be getting changed if it’s cold. a long sleeved/ high necked fleece is great for trekking during the day, you may even strip down to just a T shirt. Be sure to take sunblock and lip salve with sunblock. The gloves I took last time were useless, supposedly windproof but gave no insulation, I just put my hands in my pockets, previously I took cheap fleece gloves and they were fine. If you have ski gloves they should be fine, but it’s all extra stuff to carry. Take as little as possible. Did you read our post on Everest Base Camp trek difficulties? There’s more information in there, but it will be a lot colder when you go. A warm hat is essential, not least to wear in bed. Wool is fine, or a good fleece, as well as a hat to keep the sun off your face. I often wear a fleece buff on top of a cap and then you have the hood of your waterproof too if you need it. But it’s personal choice. My husband treks in shorts and puts leggings underneath when it gets cold. I wouldn’t dream of trekking in shorts. He would rather wear running shoes, I prefer light boots. My son treks in jeans, I trek in jeans sometimes too. I’ve seen women up there in skirts. Some people buy mountaineering gear and look like they’re summiting when they’re only going for a walk ( don’t be them, it’s embarassing!) . What I’m trying to say is, there are no hard and fast rules and everyone has different parts of their bodies that get cold. For my husband it’s his hands, he always wears ski gloves, whereas I hardly need gloves at all. Just don’t get frostbite! If I can take 2 kids to EverestBase Camp in jeans and unicorn hats I’m sure you’ll be fine. 2. Down Jacket: how thick in terms of fill and goose or duck. For Annapurna we took waterproof and down. Standard Goretex type stuff bought from the UK. I hired my down jacket in Pokhara, and my sleeping bag. We only needed them for really 2-3 days of the whole almost month up there so it’s a real pain to have to take them. We hit blizzards and actually crossed the pass in armpit deep snow. But it’s unpredictable, luck. Lots turned back. Some had no gear, some got frostbite. I think the “down” was actually synthetic. Wow Alyson sound like a pretty hectic time.. Thanks for the info! Am prepping for a trek in the Himalayas and your post was just awesome. Nice checklist to ensure you have everything in order. I am going to have trekking soon, and fantastic that i found this article much helpful and its checklist. Thanks for sharing. The problem with buying fake gear is not what you’re getting but who you’re funding further down the chain. Yes the nice little man in the shop benefits, but at the other end of the chain is most likely organised crime. It’s the reason I didn’t buy fake Ray Bans for a couple of $ is North Africa, as the funds are most likely going to terrorist groups in Africa, and of course the criminals in China. It’s simply not ethical to buy fake gear, and mountaineers have an obligation to consider ethics imo. I am going to Nepal in November, on a tour with Intrepid Travel. 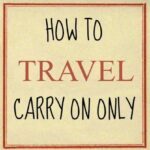 I have seen a great deal of advice on what you will need for trekking – but nothing on what to take if you are NOT trekking! I live in the sub-tropics and consequently have hardly any clothing suitable for a northern hemisphere winter! I have been hunting for some sort of jacket, both in retail stores and thrift shops. I complicate the matter somewhat with my personal preferences, ie., no zips, no hoods, no synthetics. There will not be time to look for anything on arrival in Kathmandu, as the tour starts the morning after arrival. Therefore I must find something now. Have also not been able to get a definite answer on what power adapter to take. Have seen that types C, D and M are in use – does this mean I have to take three separate adapters? Hi Lyn. I think you’ll only find it chilly at night. Just regular trousers/jeans, whatever should be fine. I just wear a fleece but I guess they fall short of your synthetics ban. They make them from recycled water bottles in Nepal, so I’ve been told… From memory, they had the 2 round pin and 3 round pin types. The 2 pin will, of course fit the 3 pin plug. I’m trying to remember if we had to use the pencil trick, sometimes you have to wedge a pencil in the top hole to momentarily “open” the bottom two pins if you only have a 2 pin going into a 3 pin. We do that a lot in India, but I can’t remember if we did for Nepal. I’m fairly sure a standard European plug works fine for Nepal but I’d really need to check with Chef, he’s my electronics wiz, but he’s out right now sorry. We usually travel with multiple plug types, including British and European, I think we saw British style plugs in Nepal too. Can you not just get a multi-adapter? Excellent post. Exactly what I needed to read while we prep for our EBC. and for all your blog !!!! They have blankets @Chloe. We never had any problem at all with not carrying them, but we only went as high as Tengboche. We lugged sleeping bags around the Annapurna circuit years ago, I don’t remember the sleeping bag situation there. No lodge we saw had any heating other than the wood or yak dung fire in the dining room. They’re all very simple and pretty flimsy. And we were up there at the end of Winter, Feb into March. Annapurna we were a lot colder and a lot higher, we had blizzards and armpit deep snow when we crossed the pass ( after being stranded by the weather for 3 days at high camp). We spend winter in Romania, where it’s colder, so I guess we’re well used to sleeping in an industrial freezer, but we were never cold under the blankets.